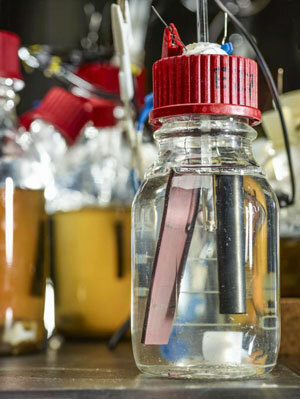 (Nanowerk News) Researchers at Helmholtz Center for Environmental Research (UFZ), Germany, and the University of Queensland (UQ), Australia, have found that the electrification of the white biotechnology is not merely a green dream, but an alternative to petrochemistry with realistic economical potential. Compared to classical sugar based bio-processes, bioelectrochemical processes promise improved yields, which could turn out to be a real game changer. The next generation of bio-production facilities may not only become more environmentally friendly, but also more economically competitive, a conclusion drawn jointly by scientists at UFZ and the UQ. In a recently published study in the scientific journal ChemSusChem ("Electrifying White Biotechnology: Engineering and Economic Potential of Electricity-Driven Bio-Production"), the researchers analysed for the first time the economical potential of this new technology using the example of an existing bio-process. Nevertheless, it is expected that the share of bio-derived, green' chemicals will significantly rise over the next decade. This market is at the centre of the so called, 'white biotechnology', focussing on biotechnological processes for the production of industrial chemicals, which is distinct from medical (red) and plant (green) biotechnology. However, achieving a broader electrification of white biotechnology is still a challenge, due to the inherently different optimal conditions for electrochemical and microbial metabolic reactions. The current knowledge gaps still require a systematic R&D effort before the technology can be introduced more broadly, as the researchers highlight in their study. The scientists now compared the saving in raw materials costs, if the electricity would serve as a source of redox power, rather than sugar oxidation, so that all sugar could potentially be used to build the lysine molecules. Based on different electricity prices in the EU and the US, different scenarios had to be considered. Assuming current market prices for sucrose as the main feedstock and bulk electricity charges on the two continents it was estimated that the electrically enhanced production could save costs of between 8.4% and 18 % in the EU and the US, respectively. "This does not even consider savings in downstream processing due to a reduced production of by-products, which is expected due to the better redox balance" Dr Krömer (UQ) said. "If one speculates further and estimates savings over a ten year horizon for a typical 50000 t p.a. plant, one would save 30 Million US$ in the EU and 50 Million US$ in the US." Dr Harnisch (UFZ) adds. While this ignores the additional investment costs to enable the bio-electrochemistry, which can currently not be reliably estimated for large scale, this example nevertheless shows that bio-electrochemical production of chemicals can also become interesting from an economical point of view.